With the immanent approach of Colonial Barracks V at the Sheraton in Metarie New Orleans some of us have been getting forces ready for the con. I have been getting a Highlander unit ready for the "Mad Guru's" Charasiab Epic NWF game and my buddy "Last Stand Dan" has been producing awesome Dhows for his Sudan Game. While checking them out on Dan’s blog I had found this little gem from the first Colonial Barracks back in 2011. The following is pulled directly from his blog. When I heard that Larry and Lori Brom putting the first The Sword and Flame at Colonial Barracks I decided right away I was going. If it wasn't for Larry Brom's Rules and the movie "Khartoum" I never would have been a war gamer. So it was a pleasure seeing Lori and Larry after seeing them at Historicon in 2004. This is the 32nd year that TSATF has been around and has stood the test of time. "The Train" Battle by Dr, Mark Stevens. The convention was at the Sheraton Metarie which is only about 25 minutes or so from the French Quarter. I took Julie and her son Aaron and we had a blast. For this first visit I took most of my time with sightseeing and playing in the evening. I am ready to go again next year. This is a perfect trip to bring your family and everyone will be happy. I took the opportunity to vista the French Quarter, eat some great food, visit the WWII National Museum, road the Street Car, etc. Great fun. Of course I kept sending pictures and text message to Tony Fryer, just to rub it in. The convention was also a fundraiser for the Creutzfieldt-Jakob Diseasse which took Sara, Wife and Mother in 1999. It is a worthy cause. I met new friends there and ran into a fellow Californio, Ethan Reiff. Well he lives in California but is from the east coast. I will be definitely visiting him in California to play in some games or conventions on the West Coast. Now Ethan drove all the way from California and put on the nice looking terrain of the battle of Maiwand. I added Ethan's Blog in my Favorite Blog sections, check it out. 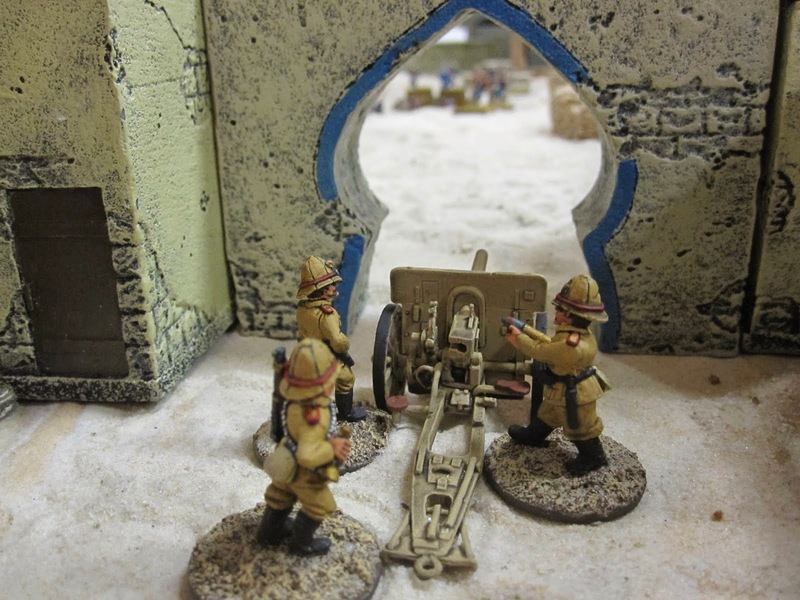 Here are some pics from his Maiwand Battle. Besides seeing Lori and Larry I got to see Jeff Baumal whom I have not seen for many years at a past Historicon. He put on some great battles and I was fortunate to play in his "The Wind and the Lion" battle. But if anyone has played the Sword and the Flame before you know the mechanics. It is a blast, especially in the Wind and the Lion battle where the Raisuli got away but Pedecarus was wounded and taken down. It almost went according to our Berber plan. The terrain as I have mentioned is fantastic and I hope to play in another of Jeff's battles at Recon in Coco Beach in the Spring. Jeff's Beautiful Wind Lion Market! Berbers ready to start the Charge! Building where the Raisuli is being held! Germans just made it to the walls! Berber Cavalry swarming everywhere through the defences. Berber Surprise attack on the left flank gate. French Cavalry defend the gate by charging into my Berber mob. Oh is that Frenchie on the ground...haha! If you saw the movie, the Marines start the Fire Works!